I was a bit nervous because the weather has been so unpredictable (and wet), I just wanted things to go well, but I was OK if she was. Driving to the session, I saw the most spectacular fall sky that I had probably ever seen, and right at 8, just as she said it would, the sun peeked out for us! Not sure if it was the amazing sky, the sun peeking out or the fact that I was doing a meaningful session that morning, but it got me choked up! It may have been sunny now, but it was COLD and WINDY! The kids were such troopers! This is not a teenager’s favorite thing to do at 8am on a Sunday morning, but they did it for mom! It was one of those times that mom said they would look back on and laugh remembering how cold and windy and crazy it was! Ten year old Timmy is also a trooper. Here is what his amazing mom had to say about his story…”I had no idea or warning that he would be born with an extremely rare disease. He was born not breathing and was whisked away to get his life saved. It was at least two hours until I heard any news. They told me I should pray. It’s hard for me to think back about these times. The last ten years have been filled with moments like this…but they have also been filled with joyful memories and love that is unconditional. Timmy’s medical conditions are many. He is completely ventilator dependent and gets all his nutrients via GJ tube. He has seizures daily and his heart is very weak. I am so glad to have done this for them. 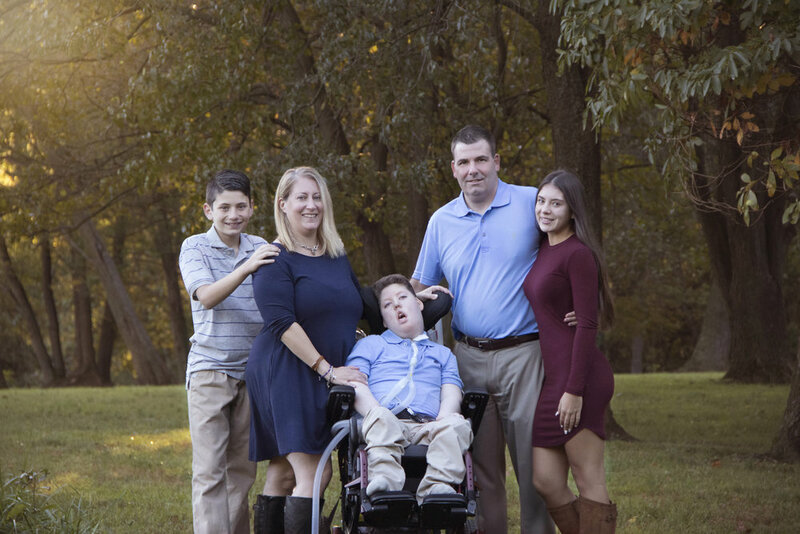 Timmy’s mom said that after the session, she could tell that he had a great time, and what makes him happiest is when the whole family is together. Meet the sponsor family for this Portraits with a Purpose session. They were a lot of fun to work with! Because of their order, I was able to photograph Timmy’s family at no cost to them, so thank you for helping to make this possible for them! This family loves to play games, watch movies and visit friends and family together! Aaron and Elena try to set an example for their daughters by always being there for the community, their neighbors, and those less fortunate than them.